Shares of Netflix (NFLX) surged 10% Tuesday to a new record after the company reported a bigger-than-expected gain in subscribers and a bullish outlook for the first quarter. 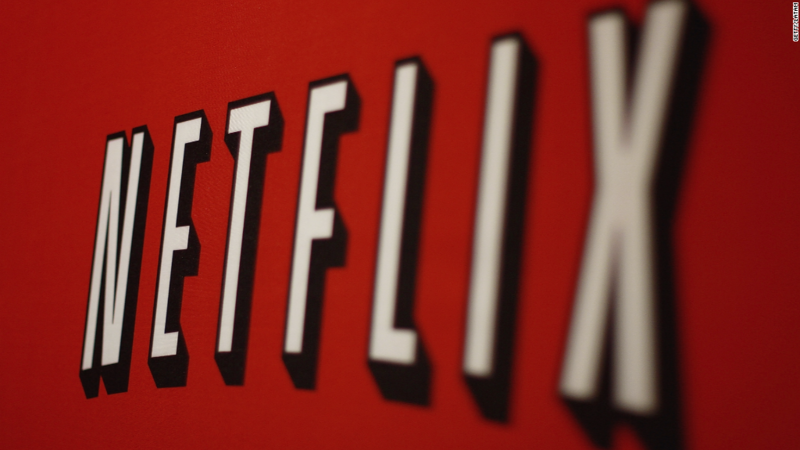 Netflix's market value ballooned to $110 billion as a result. That makes Netflix worth slightly more than Dow components Goldman Sachs (GS), Caterpillar (CAT) and United Technologies (UTX) and a tad below the market value of Nike (NKE). It is worth more than CBS (CBS), Viacom (VIAB), Sony (SNE), 21st Century Fox (FOXA) and CNN owner Time Warner (TWX). Disney (DIS) is worth $166.5 billion and will get bigger if its plans to buy the studio assets of Fox are approved. NBC Universal owner Comcast (CMCSA) has a market cap of just under $200 billion. AT&T (T), which is looking to buy Time Warner, is worth nearly $230 billion. The deal's fate is uncertain though, since the Department of Justice has sued to block it. Ma Bell's telecom rival Verizon (VZ) is stepping up its efforts in the content world too, purchasing AOL and much of the assets of Yahoo and lumping them together in a new subsidiary dubbed Oath. Verizon's market value is a little more than $215 billion. Netflix -- as well as all the other major media companies -- are also considerably smaller than four tech titans that have been investing more in the world of content lately: Apple (AAPL), Google owner Alphabet (GOOGL), Amazon and Facebook. At that price, Netflix would be worth $131 billion, which would vault it ahead of UPS (UPS), Texas Instruments (TXN) and Union Pacific (UNP) and put it within striking distance of passing struggling GE (GE).